Ratoncito Pérez stars in this fun and entertaining video that has been viewed by thousands of children across the country. Delta Dental Insurance Company and its affiliates today announced its dental wellness educational video “The Adventures of Ratoncito Pérez” is the recipient of the 2016 People’s Telly Bronze Award. The Telly Awards, founded in 1979, honor outstanding video and film productions from all over the country. Each year, People’s Telly voters get the chance to vote online for their favorite films, and this year they chose “The Adventures of Ratoncito Pérez” for the Bronze Award. The eight-minute video, which is in English but incorporates some Spanish vocabulary, tells children why it's important to take care of their teeth and shows them how to do so in an entertaining way. 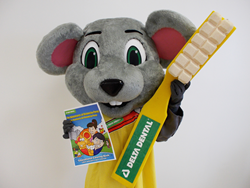 “Videos such as ‘The Adventures of Ratoncito Pérez’ help make dental education fun and memorable, and we're delighted that viewers chose us for this award," said Belinda Martinez, president of Delta Dental Insurance Company. "Promoting dental education in a culturally relevant manner to diverse communities helps us improve access to care, which is our company's overarching goal."